Just when I thought folks like Jim Lee and Amanda Conner knew it all, comes the Iron Man pizza. If only more comic art was done in this fashion, my pull list would be balanced by the savings in my grocery bill and I'd no longer have to worry about fingerprints over my mint edition of Wolverine: The 1,000 and 1th series #1. Now we need to see the picture of it cooked! 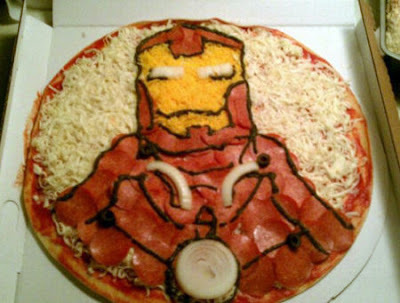 that sliced onion as the arc reactor light in the chest plate is a really nice touch! Yeah cooked TomO I think it's going to look like it went a few rounds with Ultimo! Me I can't beleive they didn't use mushrooms for the bolts - a pizza isn't pizza without mushrooms! And cheese.. and sauce... and what times dinner again? Oh! A thing of beauty! Although I made the mistake of showing it to my boy just now...and he wants it for his birthday tomorrow. D'oh Oh well Random - now you'll be able to tell us if it's as good on the tastebuds as it is an idea! Take photos if you do too.